Soames Hill (aka Knob Hill) is located in Gibsons and is the equivalent to Pender Hill in terms of height and views. From the top, you can see all the way out towards Keats Island and beyond to Vancouver Island. It is so worth the hike. Soames can be accessed from 4 different spots – Soames Rd., Ruffum Rd., Bridgeman Rd., and Esperanza Rd. With over 5 kilometres of trails you can choose either a moderate hike or a strenuous one. If hiking to the summit allow between 30 to 40 minutes each way. You will notice that I’ve mentioned hiking time, but nothing about riding. This system of trails, particularly the trail to the summit, has not been designed for riding. However, there is nothing that prohibits bikes. This trail is one that I hiked for the first time more than 35 years ago. At that time it was probably one of the highest and steepest hikes I had done (other than a hike my brother took us on when I was about 8 years old up to Garibaldi Lake). I can remember the feeling when I reached the top and saw the beautiful vistas. This is the feeling that has kept me hiking and climbing for all these years. If there is a view (or water) at the top, I will climb it at least once to see it. And if it’s as good as the Soames view I’ll keep coming back over and over again. Map courtesy of the Sunshine Coast Regional District. Click on the map to access larger, pdf version. 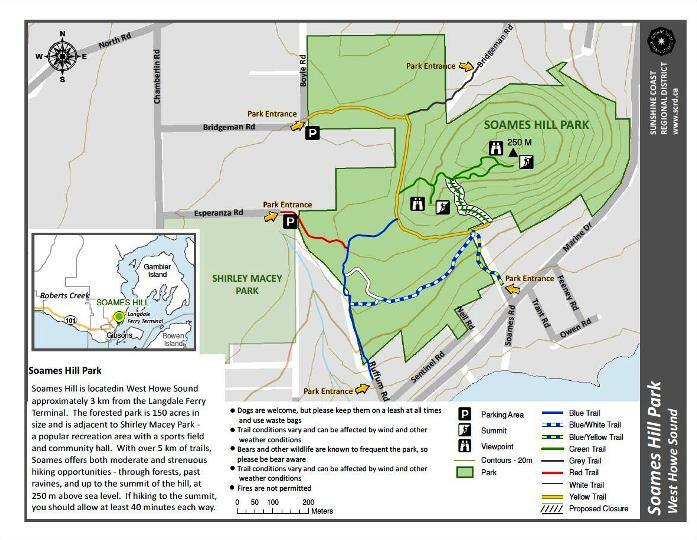 Click here to return from the Soames Hill Trails to the Sunshine Coast Trails Home page.